Thanks to a grant from the Jack Petchey Foundation the young members of Thurrock Marching Brass took to the live theatre to enjoy all the fun and frolics of the panto. This also provided the opportunity for the members to learn about how professionals handle live performances, what works and how to deal with mishaps. A great learning experience for everyone who was able to attend. 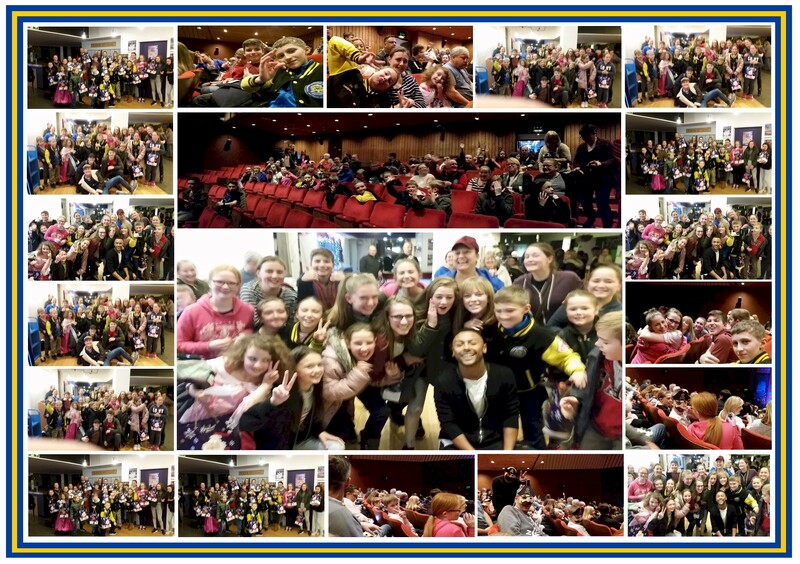 On 7 January 2017 the penultimate performance of the acclaimed panto Peter Pan, at the Thameside Theatre, starring Marcus Collins, runner-up to Little Mix on the X-Factor hit TV show in 2011, hosted a lively audience who really got into the spirit of all things panto. The young members were lucky enough to meet some of the stars afterwards, including Marcus himself, and get some tips on performance. There was lots of laughter about how much fun everyone had, followed by posing for fun photographs. Thurrock Marching Brass would like to thank the Jack Petchey Foundation for their continued support, and to Marcus Collins and the staff of Peter Pan for their hospitality and fun. Posted by News Editor on Tuesday, February 7th, 2017. Filed under Current News, Drum Corps U.K., FrontPage Feature.